IQS Directory provides a detailed list of paper shredder manufacturers and suppliers. Find paper shredder companies that can design, engineer, and manufacture paper shredders to your specifications. Peruse our website to review and discover top paper shredder manufacturers with roll over ads and complete product descriptions. Connect with the paper shredder companies through our hassle-free and efficient request for quote form. You are provided company profiles, website links, locations, phone numbers, product videos, and product information. Read reviews and stay informed with product new articles. Whether you are looking for manufacturers of industrial paper grinders, scrap paper shredders, and paper chippers of every type, IQS is the premier source for you. Our paper shredders are built to last. Since our founding, we have installed over 2,000 of our shredding solutions around the world. We work hard to fulfill you every need. Look at our website to view our extensive line of shredding products and create a customized system just for you! We want you to feel 100 percent satisfied in our orders, and we will work with you until you are completely happy. Find us online today! We take pride in our craftsmanship here at Vecoplan which is why we strive to engineer the highest quality paper shredders. These factory direct items are hassle-free and can handle the most demanding tasks. We manufacture a diverse range of products and we are confident we can find a perfect shredder to fit your needs. Please visit our website or give us a call today to learn more information about our products! Since they opened their doors in 1980, SSI Shredding Systems has extended the limits of shredding applications. They have been able to design, build and support unique solutions all around the world. From your basic paper shredders to a much more complicated device, they have what you are looking for. They will work with you to find the equipment that will best suit your needs. Need high quality paper shredders for your business? We can help! 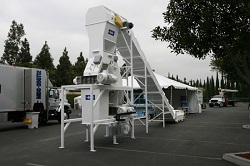 We provide high quality shredding products for a wide variety of industries. Whether you need a shredder for destroying personal information, or simply as a way to break down paper for recycling, we can help! We are leaders in the shredding industry and will work with you to find the best solution for your needs. Paper shredders are industrial shredding machines that are used for the shredding of paper. Paper shredders serve primarily as document disposal systems. Document disposal is important in industry, commerce and in consumer products contexts for the protection of private information. In consumer contexts, document shredders are used to destroy outdated or otherwise unneeded documents that contain sensitive personal information like receipts, bills and many other documents that may contain information that could compromise an individual’s privacy if disposed of without shredding. In commercial contexts, document shredders are an essential part of protecting customer privacy, trade secrets and many other business functions that require secure destruction of sensitive paper documents. Hospitals, banks and government agencies rely heavily on machines and services to prevent accidental disclosure of confidential information. The range of different paper shredder configurations begins with simple, waste bin-sized consumer strip-cut shredders and ends with industrial-scale multi-axis paper shredders used by companies that specialize in document shredding for other companies. These shredders can often shred thousands of pounds of paper per hour. Some document shredding services even offer mobile shredding services, which can involve a shredding machine installed in the back of a truck that travels to businesses and collects material to be shredded. Paper shredders are classified according to the type of end-product they create. Strip-cut shredders produce long strips the same length as the paper being shredded. While common in homes and small businesses, these shredders are the least secure and produce the largest volume of waste. 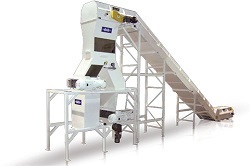 Cross-cut shredders use two rotating drums to create smaller rectangle or parallelogram shaped pieces, while particle-cut shredders create tiny square or circular pieces. Granulators and disintegrators produce even smaller pieces, cutting paper randomly until it is small enough to pass through a mesh. Hammermills pass paper through a screen, shredding it in the process. Lastly, pierce and tear shredders do as their name suggests; they pierce and tear until the paper is shredded. Paper shredding is an all around excellent means of secure document disposal. It is effective, and the byproducts are almost always completely recyclable. Because most paper recycling processes involve a pulping process, the small size of the shredded particles does not preclude recycling. Paper shredding has become so important to industry and commerce in the United States that federal standards have been developed to regulate the process by which important documents are disposed of in certain contexts. The Health Insurance Portability and Accountability Act (HIPAA), the Gramm-Leach-Billey Act (GLB), and the Fair and Accurate Credit Transaction Act (FACTA) are just a few examples of these regulations.